Bi-monthly newsletters, each including a timely article relevant to the design industry and authored by an industry expert. No engineering project is without risk. Somewhere between the goal of designing the best bridge, building or water treatment facility and running a profitable business lurks the ever present possibility of litigation. A legitimate disagreement can occur, a company can make a mistake, or a firm or government entity—or a member of the public—can file a lawsuit that forces the firm to defend itself and its work. “A lot of risks exist and they’r e not necessarily related to the quality of the work performed,” says John Moossazadeh, a senior vice president at Kleinfelder in San Diego. 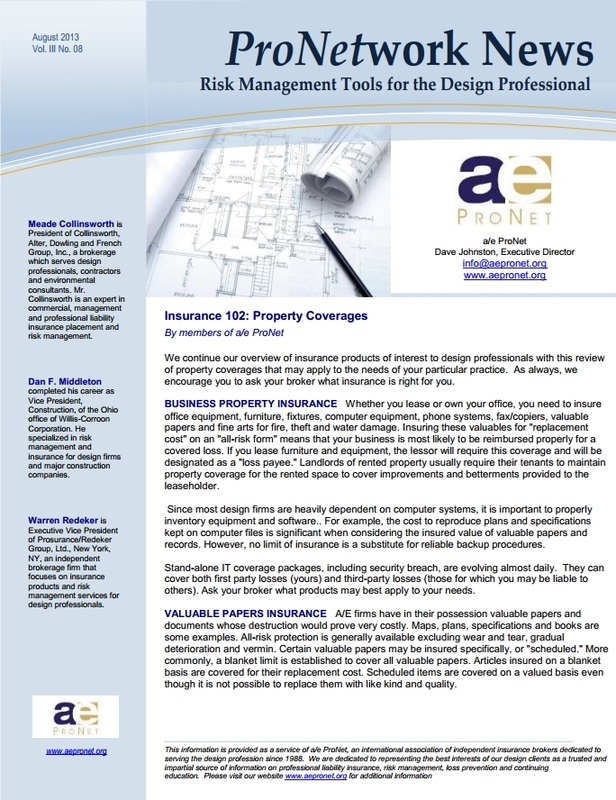 We continue our overview of insurance products of interest to design professionals with this review of property coverages that may apply to the needs of your particular practice. As always, we encourage you to ask your broker what insurance is right for you. In the last 20 years, regional and smaller design firms based in the U.S. have found a new demand for their services in the international marketplace. Foreign clients now seek the services of boutique firms and specialty consultants, and what was once the sole domain of large design firms is far more common. 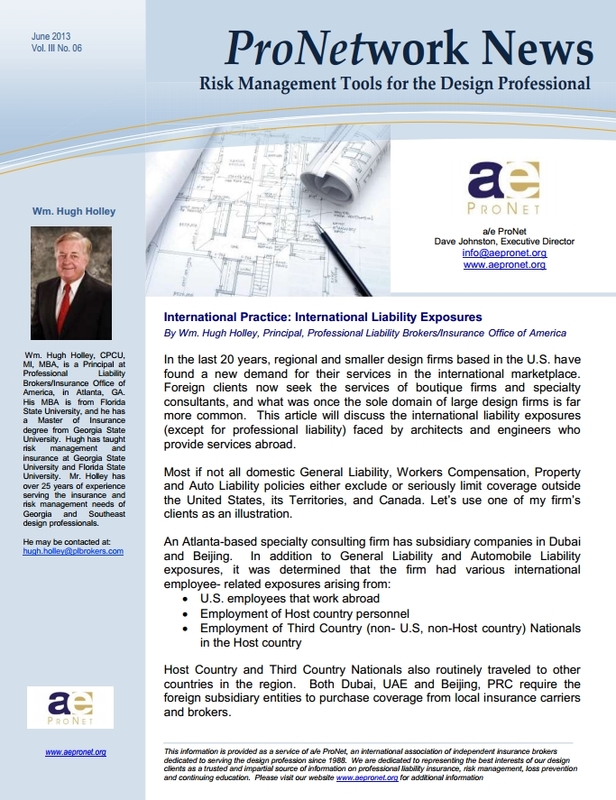 This article will discuss the international liability exposures (except for professional liability) faced by architects and engineers who provide services abroad. 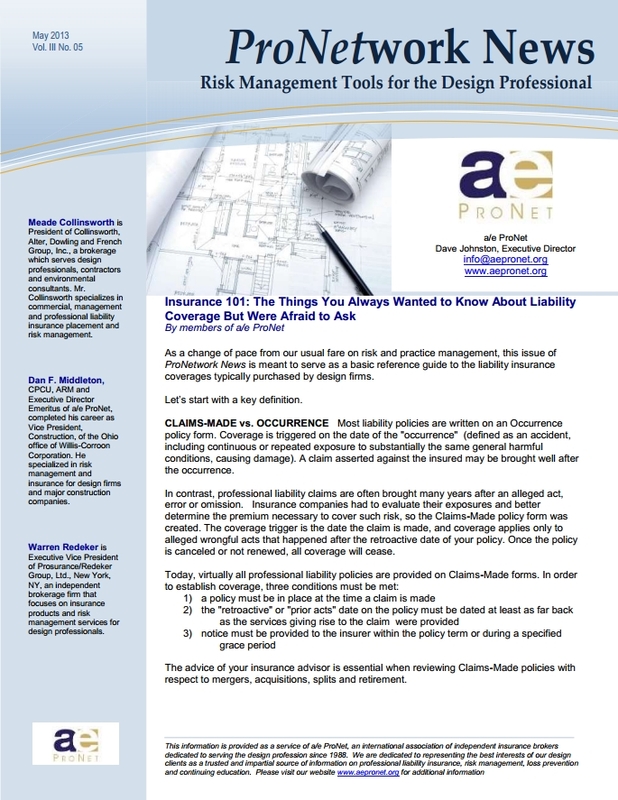 As a change of pace from our usual fare on risk and practice management, this issue of ProNetwork News is meant to serve as a basic reference guide to the liability insurance coverages typically purchased by design firms. Let’s start with a key definition. CLAIMS-MADE vs. OCCURRENCE Most liability policies are written on an Occurrence policy form. Coverage is triggered on the date of the “occurrence” (defined as an accident, including continuous or repeated exposure to substantially the same general harmful conditions, causing damage). A claim asserted against the insured may be brought well after the occurrence. 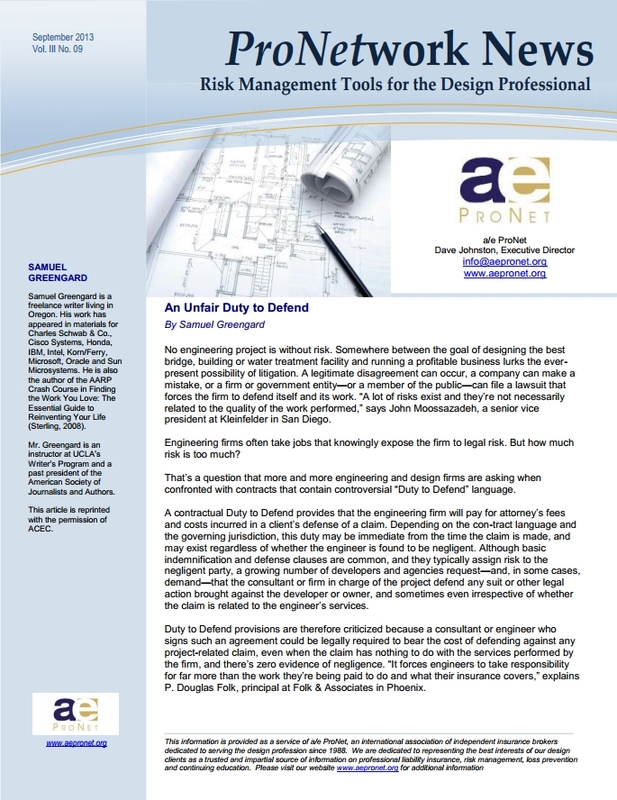 Imagine a case where an engineering firm was found to have had an expensive duty to defend claims asserted against a developer, even after the engineer’s performance was judged not to have violated the professional standard of care. That was the decision three years ago, in the California Court of Appeals in UDC – Universal Development L.P. v. CH2M Hill. In fact, that case extended another one, decided two years earlier in the California State Supreme Court. (Crawford v. Weather Shield Mfg., Inc.). 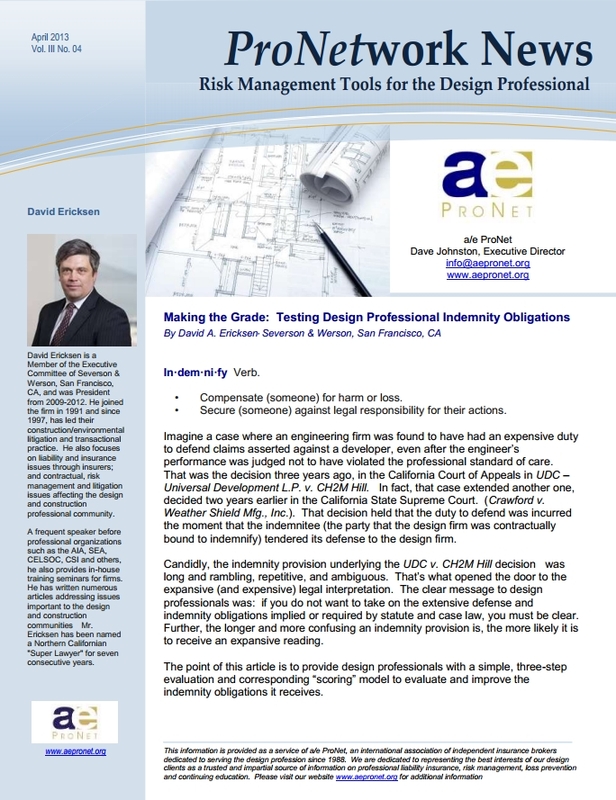 That decision held that the duty to defend was incurred the moment that the indemnitee (the party that the design firm was contractually bound to indemnify) tendered its defense to the design firm.